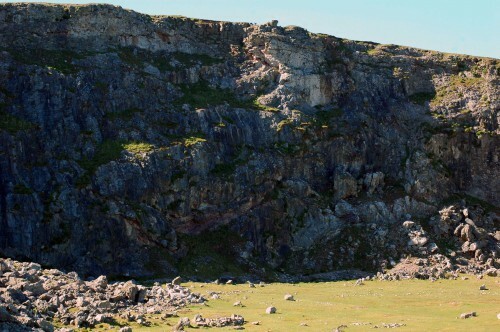 The Little Orme is a highlight of both the northern Wales Coast Path and the North Wales Path; it is a Nature Reserve with diverse habitats and wildlife and is popular with visitors and locals. I walk here often throughout the year but thought I would photograph this walk, taken at the end of April, as though I was following the Path, while meandering around as I usually do admiring the views and the special wildlife. 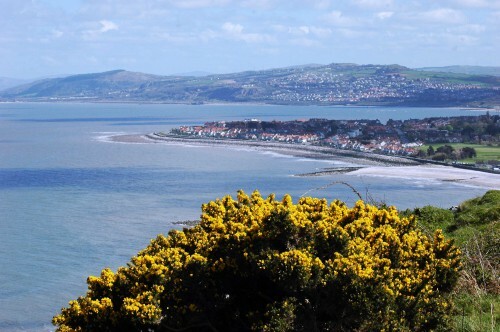 The Coast Path follows the promenade from Rhos-on-Sea around the Point and up to Penrhyn Bay. To reach the Little Orme turn off the main road and walk along Beach Road, which ends in a cul-de-sac where there are steps up to the site. Turn right at the top of the path from the steps to continue on the route. 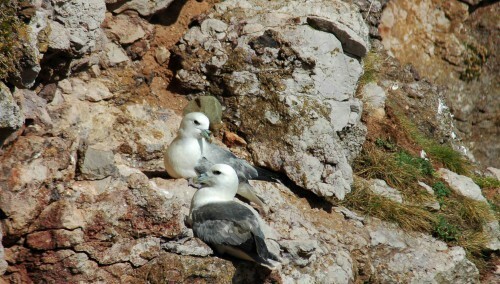 In late winter to early spring Fulmars return to their nest sites here. 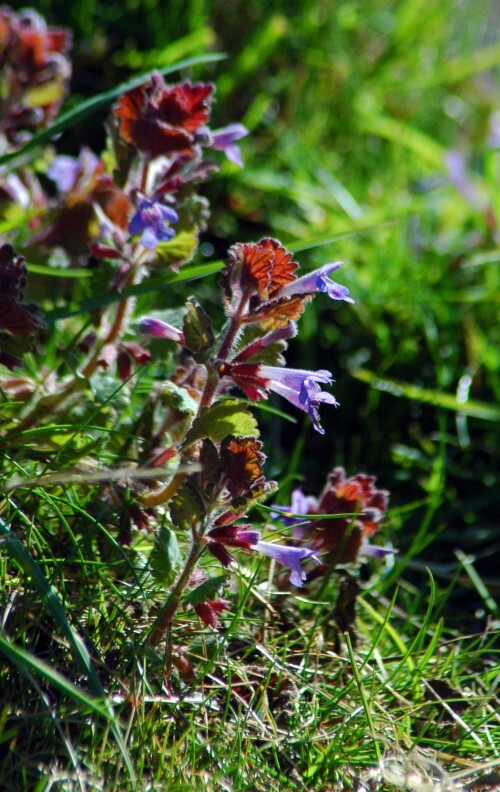 They are noisy birds and vocalise loudly in the first weeks of their return as they sort out who is nesting where. 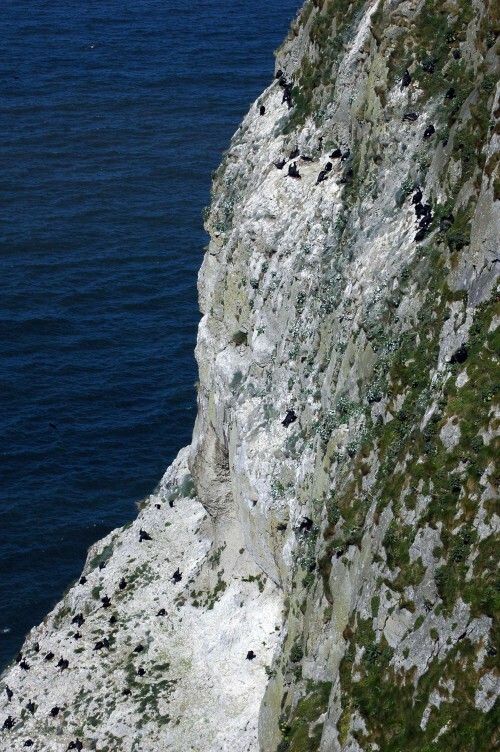 Now, in late April they have quietened down and are settled into their nest sites on the more sheltered sides of the cliffs. 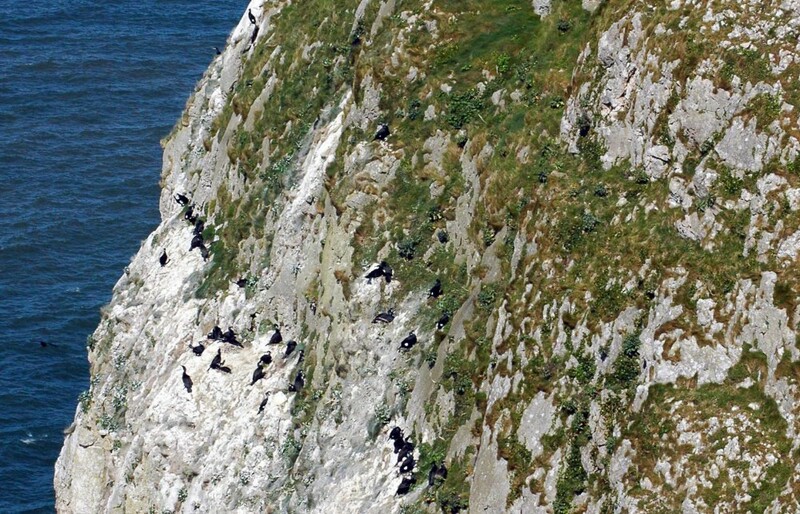 There are currently five pairs on the more inland cliff and three or four more pairs on the lee sides of the cliff faces nearest to the sea. Their numbers are few but seem to be reasonably consistent year on year. 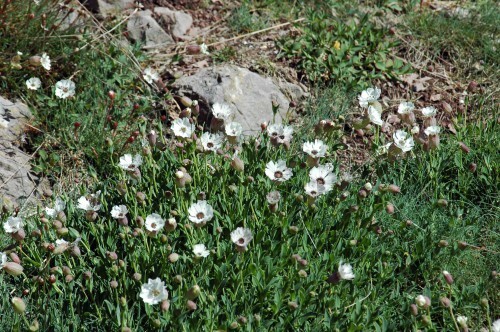 At the base of the cliff forming one side of Angel Bay, Sea Campion is flowering. 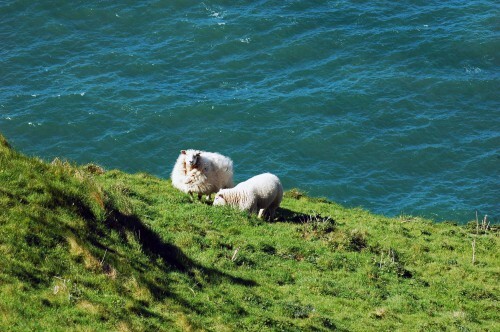 I usually head for the cliff edge overlooking Angel Bay to see if there are any Grey Seals about. Today there were just two young ones swimming close to the rocks. 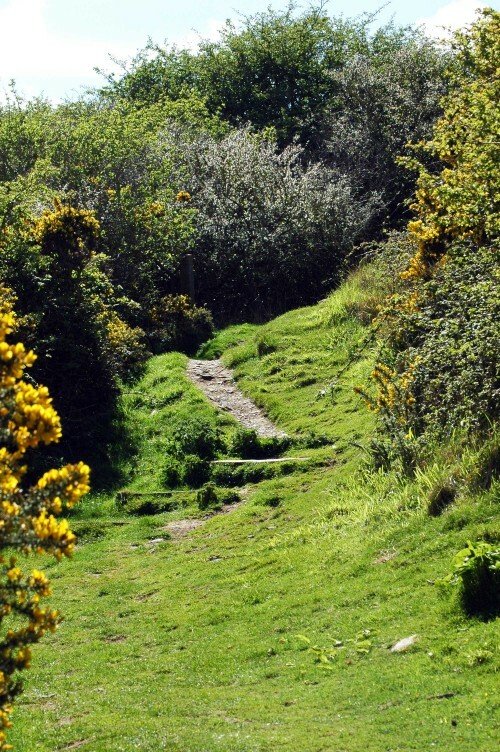 The path to the summit involves an initial steep climb up an incline locally known as ‘Rabbit Hill’. It looks a gentle slope in the photograph, but it really isn’t, especially when you are as unfit as I was after my marathon-long virus! I had to stop twice today, but who cares when there are stunning views to look back at. 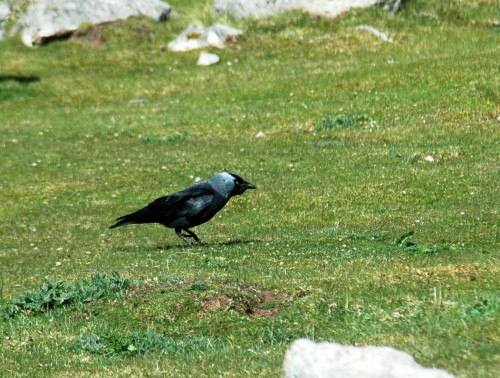 Jackdaws are numerous residents and pairs of the characterful birds are nesting in nooks and crannies all over the cliffs. It’s always good to see them nesting communally in their ‘proper’ habitat rather than in the chimneys of houses in towns and villages. There are a particularly large number of them nesting up on the cliff at the back of the flat quarried-out grassy area at the top of Rabbit Hill and as I reached there I watched them as they used their numbers to chase off two Herring Gulls that were probably speculating for unguarded eggs. Onwards and upwards from the rock-strewn quarry field the track is bordered by gorse bushes and the air was perfumed with its wonderful coconut scent. 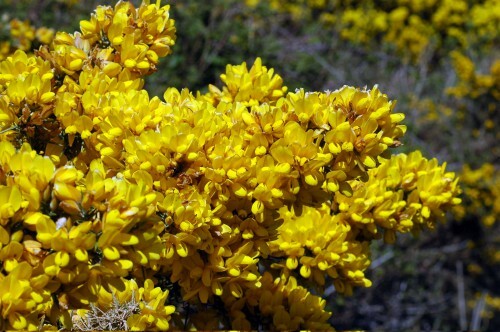 Every bush was smothered with thousands of tightly packed golden flowers, a truly glorious treat for both eyes and nose. 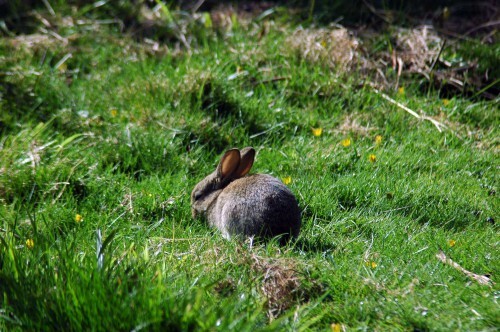 The grass is kept closely cropped by both rabbits and wandering sheep and a variety of birds including blackbirds, robins, chaffinches, goldfinches and dunnocks all forage here on the ground or amongst the scrubby shrubbery. 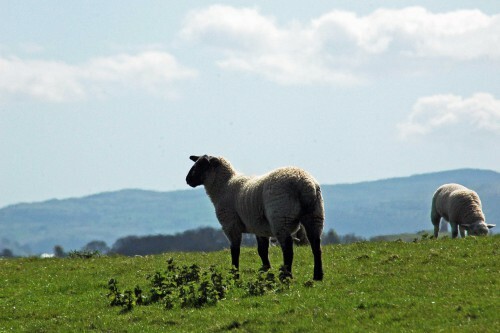 The track upwards bends to the right now and passes by an enclosed rough pasture grazed by sheep and is frequented by Jackdaws. 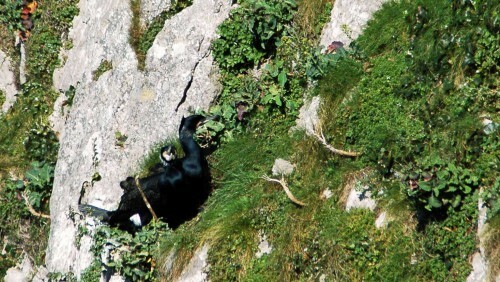 It’s always worth checking to see if any of the black birds are actually Chough. 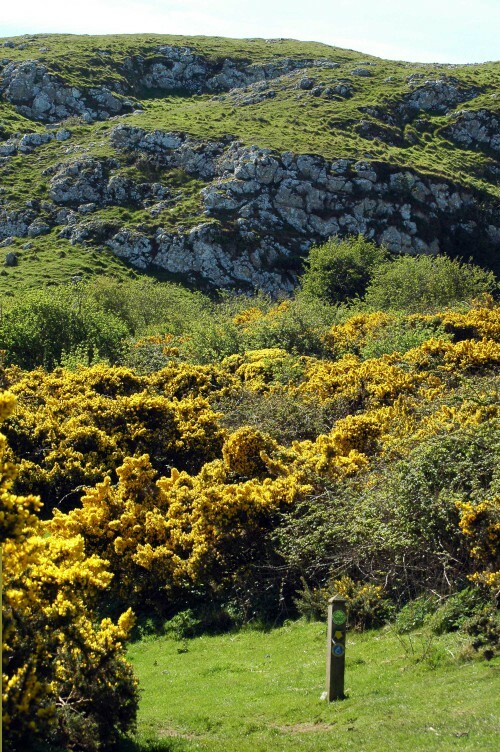 At the top of the field the track turns sharply left and continues bordered by more gorse, blackthorn and hawthorn. 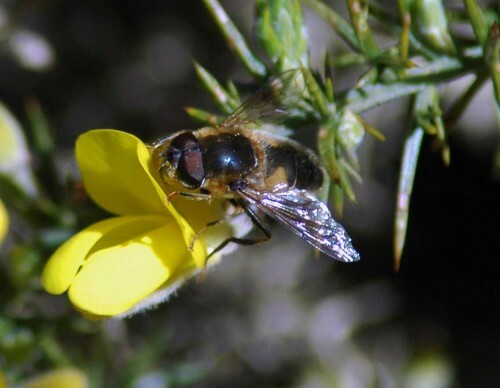 Today walking through the fragrant gorse and blackthorn blossom was blissful. 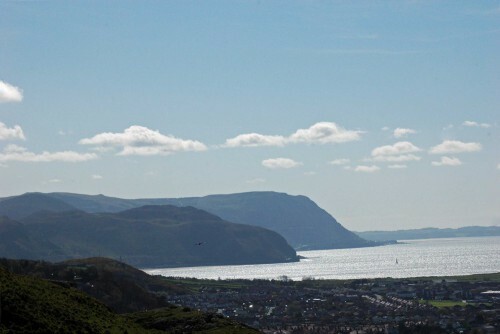 If you had been walking the Coast Path, there is a perfect view from the top of this section of the track of where you have walked if coming from the direction of Abergele, or of where you will be walking if going the other way. I could hear a Chaffinch singing so diverted from the main track here along one made by sheep to try to find him. 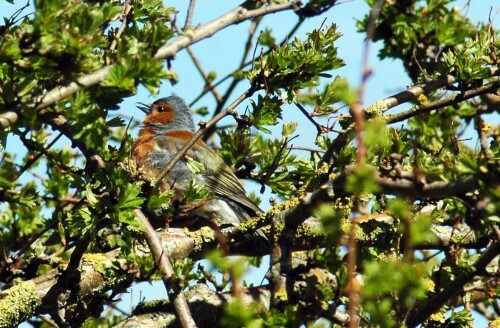 It wasn’t long before I spotted him in a hawthorn tree preening himself and intermittently responding to the song of another male somewhere nearby. 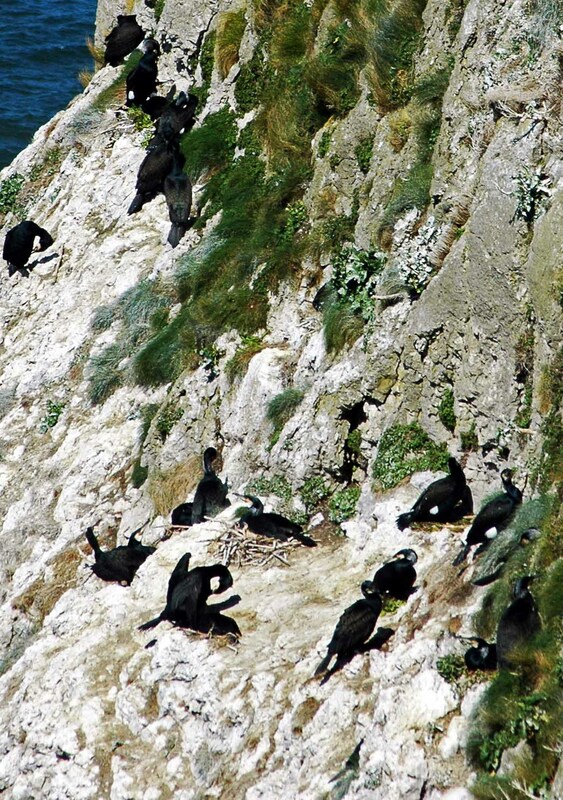 One of the reasons for taking this walk today was to check up on the Cormorants that nest on the sea cliffs of the headland. I wouldn’t recommend making this diversion to the cliff edge if you have children or a dog not on a lead with you, or if you are of a nervous disposition as to get a good view of the birds you do have to go carefully down a slope which has no barrier between its edge and the drop down. It was windy today too, as you can see by the ruffled sea. 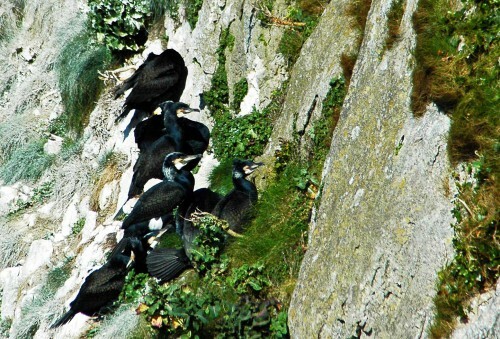 There are large numbers of Cormorants here all year round and in Welsh the bird is known as ‘llanc llandudno’. 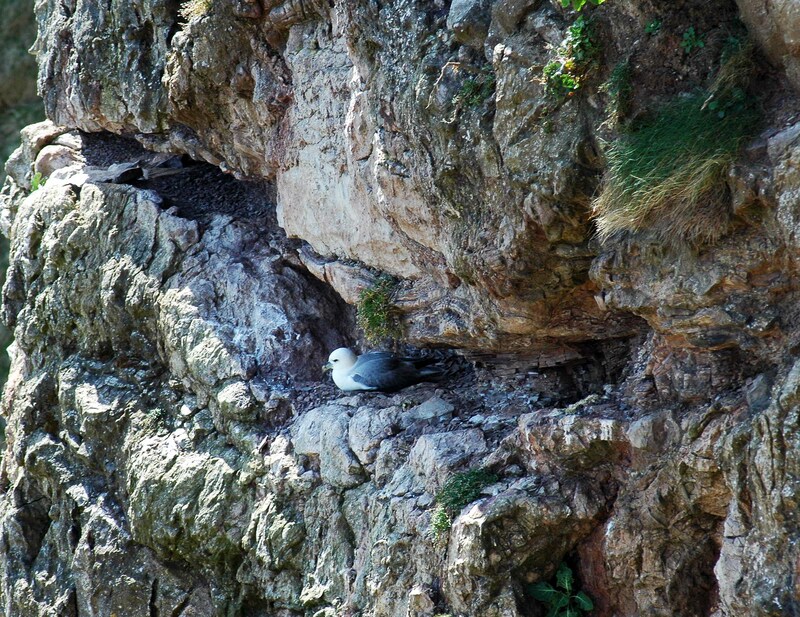 I’m sure they have nest sites all around the headland, but this is the only one I know of that is reasonably visible from the cliffs. 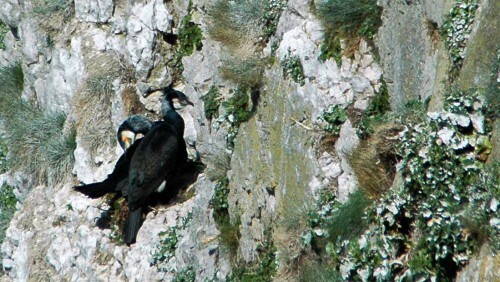 The limestone rock is smooth and sheer so it is amazing that the Cormorants, quite large birds, find safe places to site their nests here. There are three areas the birds are gathered in, an area at the top, a middle section and a few on a shelf quite near the bottom. Fascinating as the Cormorants were, it was chilly here on the windy cliff, so I went back up and along the cliff edge to the part below the summit which was sheltered from the wind and from where there are stunning views across the bay to Llandudno’s Victoria Pier and Little Orme’s big brother, the Great Orme. In the background is the Isle of Anglesey.This view shows the route of the ongoing Coast Path around Llandudno Bay. 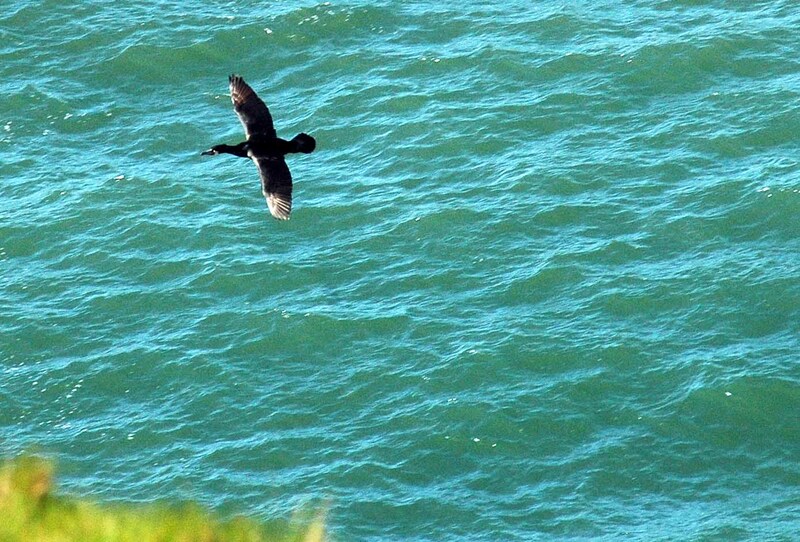 Cormorants race past and Herring Gulls are always to be seen flying or gliding around this part of the cliff, and there is occasionally a Kestrel, but today I was surprised to see two Buzzards flying out over the sea and a Sparrowhawk flying in and heading towards the Great Orme. It is possible to go up a little further to reach the trig point on the summit but the views are no better from there so I don’t often get that far and turn around to go back the way I came. 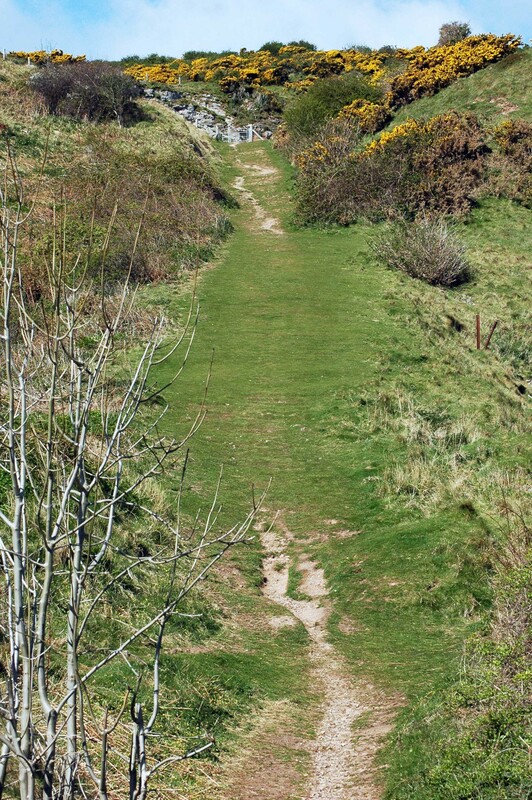 If you were following the Coast Path though you would follow the track that takes you down to rejoin the main road at Craigside and continue towards Llandudno.